The Surrey Hills are where City meets country, and the towns and villages around Guildford have always been prime Country Life territory. It was here that the City bonus bonanza kick-started the country property boom in late 2005, and, judging by the upbeat attitude of leading Guildford based country-house agents, this could well be the area that signals a return to ‘business as usual’ in the early months of 2010. Fortune favours the brave, and when, in 2008, seasoned country-house agent Michael Parry-Jones took a year’s sabbatical to go travelling in Europe, his fellow professionals must have thought he’d completely lost the plot. Not so. In April this year, he launched his new Grantley estate agency (01483 893939) at Wonersh, near Guildford, and has already notched up an impressive list of properties sold, mainly in the £1 million to £2.5m family-house bracket. They included pretty, five-bedroom Wonersh Hollow, with three acres of gardens and grounds at Wonersh, launched in June and sold in July at a guide price of £1.7m, and pristine, 15th-century Bonners with 11 acres at Hambledon, scheduled to launch in September, but sold prior to that in August, at a guide price of £2.25m. But price is absolutely critical, he says, and still on his books is the charming, Grade II-listed Faggots Stack at Lurgashall, on the Surrey/West Sussex border. It failed to find a buyer at its original guide price of £1.25m in September, but has since attracted significant interest following a reduction in price to £1.1m. As usual, the real bugbear has been the shortage of houses for sale, which seems incredible given the current strength of demand. But, as Mr Parry-Jones points out, ‘moving house these days is incredibly expensive, and given the mixed messages circu-lating in the media, when in doubt, most vendors will opt to stay put rather than risk trying to sell in an uncertain market’. After a languid start to the year, John Denney of Hamptons’ country-house division has seen a 76% surge in the number of new buyers registering with his firm this autumn compared with the same period last year, when, it must be said, the species seemed in danger of extinction. He attributes the increase in numbers to the fact that interest rates remain low, the stockmarket has gone up by 50% in the past six months, and the prevailing weak pound is tempting overseas buyers back into the Surrey market. The number of sales agreed this year has also risen year on year, but with stock levels generally down by at least 30%, the number of houses sold continues to outstrip supply, which will give the upper hand to sellers in the early part of 2010, Mr Denney believes. The celebrity end of the market has been surprisingly busy, he says, especially in the £8m-plus price bracket, where prices are back to 2007 levels. He found a buyer at £11m for Grant Bovey and Anthea Turner’s plush, 102-acre Barbins Grange estate at Dunsfold. The couple then bought the 130-acre Hascombe Court Farm near Godalming from Chris Evans for about £5m. Hamptons (01483 572864) and Savills (01483 796820) are offering the immaculate, 21-acre Okewood Hill estate (pictured) on the edge of the Surrey Hills, five miles east of Cranleigh, at a guide price of £12m. At the heart of the estate, which dates from Roman times and was more recently owned by Oliver Reed and Jim Davidson, is a 16,000sq ft, Grade II-listed, Tudor house, which has been extended and upgraded by its present owner to 21st-century standards-and beyond. Dripping with designer chic and technology, it has three reception rooms, a music gallery, a 35ft Clive Christian kitchen/breakfast room, owner’s and guest bedroom suites, plus an indoor pool, a gymnasium, a home cinema, a cottage, stabling, a helipad and a heated koi carp lake-all set in beautifully mani-cured gardens and grounds. ‘In the current market, it’s vital to get the price right; there’s no shortage of buyers, but they won’t pay over the odds,’ reiterates Tim Harriss of Knight Frank in Guildford, who reports a very good year’s trading overall, after four early months of ‘utter gloom and doom’. 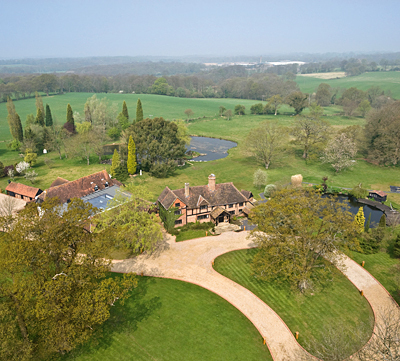 It all kicked off with the probate sale of Georgian, Grade II-listed Home Farm House at Shackleford, near Guildford, which launched on the market at £1.8m in April (Property Market, Country Life, April 8) and sold for more than £2m in May. Knight Frank (01483 565171) are currently offering the Grade II-listed, 15th-century Manor House at Pirbright, six miles from Guildford, at a guide price of £3.95m. The historic manor, which formed part of the marriage portion of Catherine of Aragon in 1509, was extended in Victorian times and again in 2000. Set in 18 acres of land, the charming, 9,232sq ft house has four main reception rooms, a study, a kitchen/breakfast room, seven bedrooms, five bathrooms and an indoor swimming-pool complex. Outbuildings include a coach house, barn and stables. But the highlight of Mr Harriss’s year was undoubtedly the sale of Grade I-listed Ald-worth House at Haslemere for ‘well over’ its £10m guide price to an international buyer. Built by Sir James Knowles in 1869 for Alfred, Lord Tennyson, who chose it for its magnificent views and total privacy, the grand stone house remained in the hands of the Tennyson family until after the First World War, when it was sold to an Indian maharajah, the Gaekaar of Baroda. Since then, it’s been beautifully renovated and modernised by the recent vendors, who bought the house in 1993. After almost two years of stop-start, David Rathbone of Strutt & Parker (01483 306565) is encouraged by the much more positive picture that’s emerged in recent months. With frustrated buyers pitching in for anything new, one bun-fight involved the delightful Coach House at Shamley Green, which sold for about £2m in September, against a guide price of £1.75m. The house, designed in the 1880s by Philip Webb, was the former stable block to the surrounding Willinghurst estate, converted to a four-bedroom family house in the 1950s. Mr Rathbone is presently offering two classic Surrey houses, one at either end of the refurbishment spectrum. Secluded, Grade II-listed Fairfield at Chidding-fold, a traditional 17th-century farmhouse with Georgian additions, has been lovingly restored by its owners in the past 10 years. It has four reception rooms, five/six bedrooms, three bath/shower rooms, a converted barn, a swimming pool and a tennis court, set in four acres of formal gardens and grounds. Strutt & Parker quote a guide price of £2.75m. In contrast, Enton Rough at Station Lane, Enton, is a 1910 character house with ‘enormous potential’, which stands in two acres of gardens overlooking the West Surrey golf course. Strutt & Parker quote a guide price of £1.7m for the house, which has three reception rooms, a kitchen/breakfast room, six bedrooms and three bath/shower rooms, all in need of updating. It’s being sold following the decision of its owners, who have lived there for 40 years, to return to their native Holland.